The Newcastle upon Tyne Royal Grammar School numbers one Cuthbert Collingwood amongst its previous students, albeit at earlier premises within in the City. 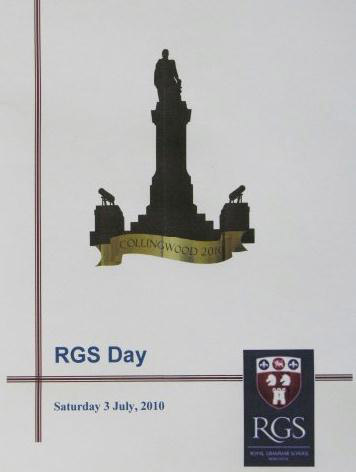 The Festival was therefore delighted when the Headmaster, Dr. Bernard Trafford announced that the school would be supporting the Festival and recognizing Collingwood’s legacy at their 2010 Open Day. Alongside academic displays, sporting events, prize giving ceremonies and the usual stuff of school open day programmes, there was a Junior School art competition, themed on Collingwood, a march past by the school’s Combined Cadet Force detachment, with the salute taken by Lt Cdr J. Dando RN of HMS Calliope and an inaugral Collingwood lecture, entitled “The 98-gun Floating Classroom”, delivered by Collingwood biographer, Max Adams. The highlight of the Day for many was however a fantastic piece of street theatre on the life of Admiral Lord Collingwood from schoolboy to naval hero, written by Chris Goulding, directed by Trevor Walters, performed by a highly competent and enthusiastic group of 14-17 year old students and with no small musical input from Dr Trafford himself. 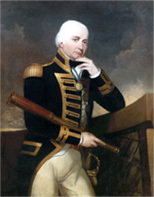 How apt that, on one side of the hall, the Admiral gazed sternly down on proceedings from his life-size portrait while, on the other, seated within the appreciative audience, was Mrs Susan Collingwood-Cameron, a descendant. The former may have been a bit embarrassed as to the tribute, but Mrs Collingwood-Cameron was impressed and honoured by the work and effort invested in the legacy of her ancestor. The Festival acknowledges the contribution of the Royal Grammar School to this year of remembrance and trust that the legacy will live on within the school. Click here for a gallery of images from the day.